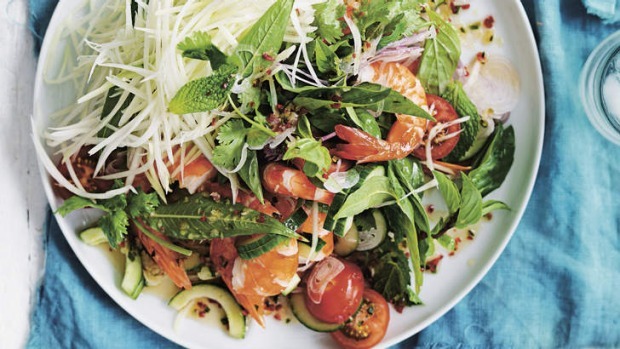 With notes sweet, sour and salty, this salad is dressed to thrill. For the dressing, place the garlic, coriander root and sea salt in a mortar and pound with pestle until the mixture makes a rough paste. Remove and place in a bowl. With a mortar and pestle, dissolve the palm sugar with the fish sauce, ensuring there are no lumps. Add to the garlic and coriander mix, along with chopped red and green chillies, and stir well to combine. Add the lime juice. Taste and adjust if necessary, to ensure there is a balance of sweet, sour and salty. wet the salad. Mix through thoroughly. Share between four plates and top with any leftover dressing. Serve immediately.